Ship ahoy! 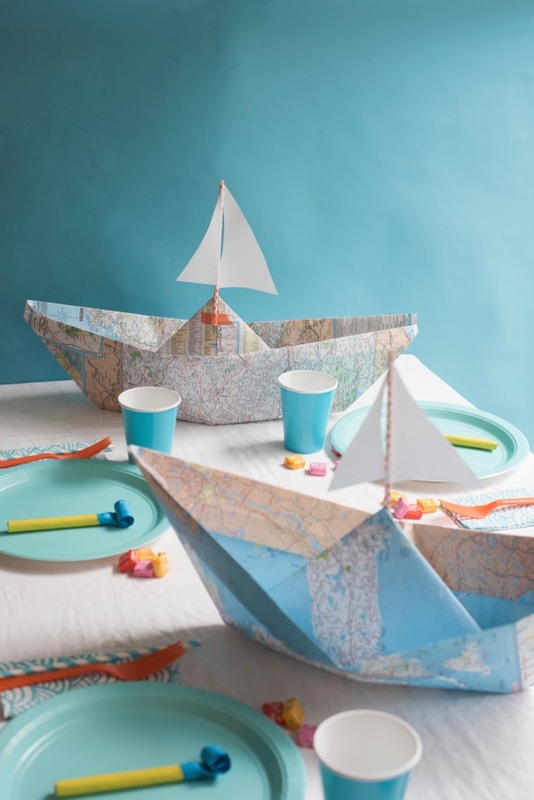 Make these giant map boats for your next bon voyage party – or they’d be perfect for an “Around the World” Baby Shower! 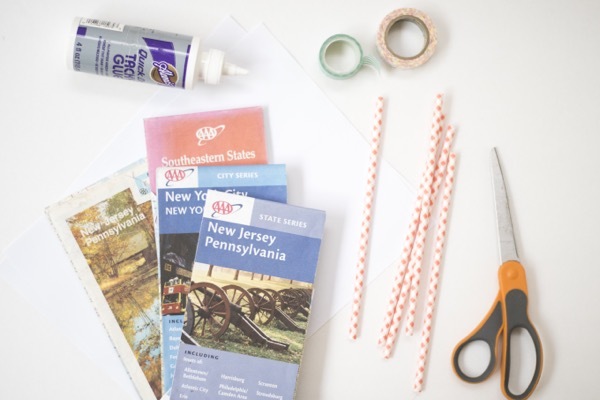 Also great for any kind of little adventurer birthday party… especially one that includes a treasure hunt. 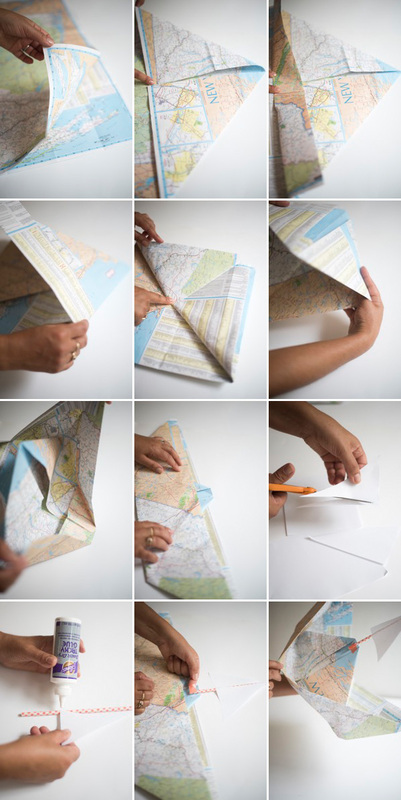 Step 1: Take a giant AAA map, open it fully, then fold top to bottom. 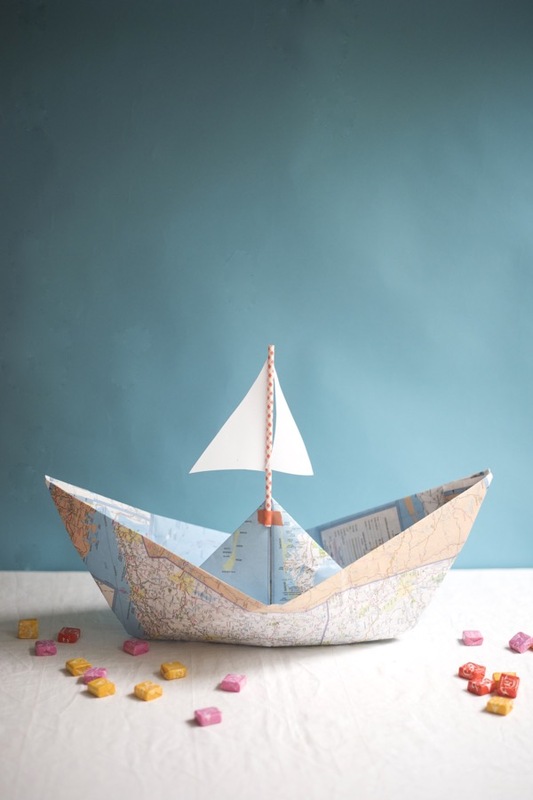 (The maps are 36″ x 48″ and the finished boat should be about 23 1/2″ x 6 1/2″). Step 2: With the crease at the top, fold the top two outside corners in toward the middle. Step 3: Fold the front bottom edge up, flip over, and repeat, folding the bottom edge up. Step 4: Smooth and flatten the map. Step 5: Put your hands in the opening, pop the sides out, and flatten the new shape. Step 6: With the opening on bottom, fold up the front. Flip over, and fold up the back. Step 7: Again, put your hands in the opening, push the sides out, and flatten. Step 8: Gently pull down the sides to pop open. Step 9: Cut white paper to create two triangles roughly 5 1/2 x 3 inches and 4 1/2 x 2 inches. Curve the longest and shortest sides slightly to create a billowing sail. Step 10: Glue the “sail” to top half of paper straw. Let dry. Step 11: Tape the sail to the tip of the boat. Step 12: Gently open the underside of the boat and smooth out any creases or ripples. Optional: Attach ribbon or thin elastic to go under the neck. 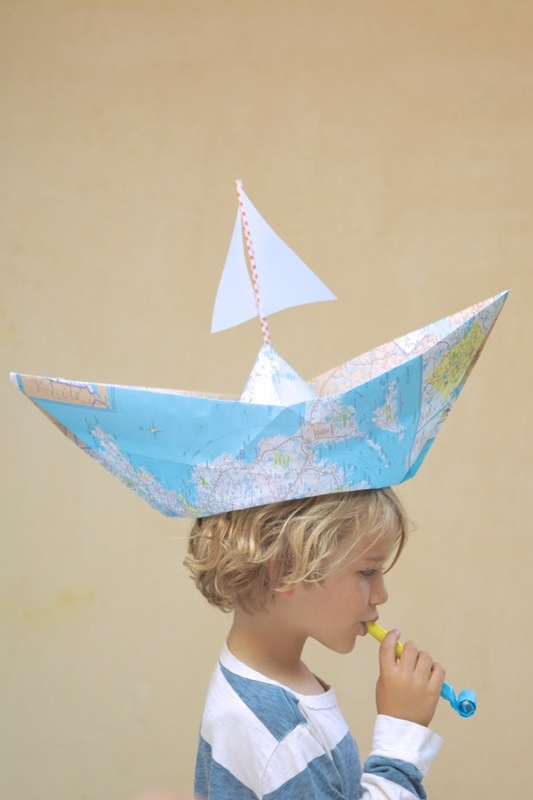 (You could even remove the thin elastic off a set of pre-made party hats for this purpose). Might I suggest checking out Curious George’s instructions for the boat-folding party, which happen to be a lot better than mine! I love how simple and beautiful this is. My son loves maps. We’ll definitely be doing this together. These centerpieces are so fun! 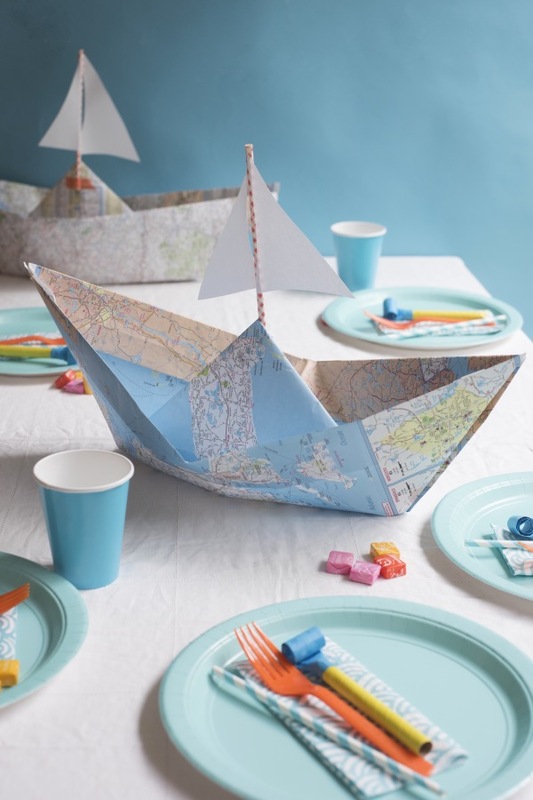 This is perfect for a little boy party!